What are the Fieldset and List boxes on my Form tab? / FAQ / FAQs / What are the Fieldset and List boxes on my Form tab? Fieldset, legend, and list items are the foundation for all CF7 Skins Templates. They are a key part to the structure and style of your form. The FIELDSET item groups together related form fields. The LEGEND item helps provide context to each fieldset by adding a title. LIST-OL items act like a group of related LIST-LI items. LIST-LI items act like containers for a form’s field tags (Contact Form 7 Tags), such as Checkbox, Text, Date, etc. The fieldset at the top provides a title (legend) for the entire form. The list-ol groups together list-li items that are related. Tip: If you duplicate a LIST-OL, it will duplicate all of the LIST-LI and tags inside. This can save a huge amount of time if you have similar sections on your form. Customization and options for the form layout is both easier and more versatile. Contact Form 7 form tags are visually less cluttered and easier to tweak. Advanced and detailed CSS styling is much easier. Accessibility such as tabbing navigation for visual user agents and speech navigation for speech-oriented user agents. Tip: You don’t need to fully understand these items in order to use CF7 Skins. We recommend selecting a Template and following it as a guide. 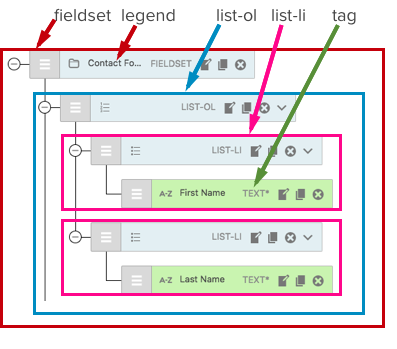 To see all of the advantages to using fieldset, legend, and list, go to Why we use fieldsets, legends, and lists in CF7 Skins. For more in-depth explanations on CF7 Skins Items, take a look at the tutorial Understanding fieldset, legend, and list field items. How do I edit my CF7 Skins form (using Visual Editor)?